For over fifty years, Jan Akkerman (b. 1946) has been one of Holland’s most respected guitarists. In addition to his leading role in the globally acclaimed bands like The Hunters, Brainbox, Focus and collaborated with many local and international artists, in his solo projects, Akkerman has combined rock, jazz, blues, classical music and dance in his own distinctive style. Throughout his respected career, Akkerman has appeared on worldwide stages. Besides several gigs at the Montreux Jazz Festival, the North Sea Jazz Festival, he has played on countless tours around theatres and various stages, also performing far beyond Europe in countries/comtinents like Japan, Russia, Syria, North & South America and Australia. Since early 2012, Jan has revived his old Brainbox times with the start of My Brainbox, featuring ex-Vandenberg singer Bert Heerink. This project was in celebration of Akkerman's 50 years of activity on worldwide stages. Jan also continues to design his own guitars. In 2013, he drew out the new J.A. Personal II for the Dutch company, Brandin Guitars. 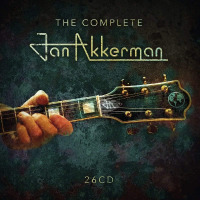 In 2005, Akkerman received the prestigious Golden Harp Award for his complete oeuvre and, again, garnered recognition and support for his distinctive role in guitar music by many people. At the end of 2012, Akkerman was knighted in the Order of Oranje Nassau, in recognition of his influential contribution to Dutch music. Since 1968, Akkerman has released many solo records, on which he has let his creativity run free. Fifty years later, the Red Bullet record company has compiled his work into the 26CD box set, The Complete Jan Akkerman, featuring all of his solo albums, his most important live records, his work with Johnny and his Cellar Rockers, The Hunters, Brainbox and Focus, as well as a selection of previously unreleased recordings. Even now, in 2018, Akkerman is still considered the most influential guitar player ever to come out of the Netherlands. For generations, he has impressed and inspired a large numbers of guitarists with his timing, harmonics, virtuosity and ability to perform with a wide range of musicians from various musical backgrounds. He has always taken chances and forged his own path, as is evident across his twenty-plus albums and countless concerts. Being fresh, energetic and unpredictable, Akkerman continues to perform at the highest level, sharing his passion for the guitar with current band members Coen Molenaar (keyboards), David de Marez Oyens (bass guitar), Marijn van den Berg (drums) and, last, but not least - in fact foremost - with his worldwide audience. All About Jazz musician pages are maintained by musicians, publicists and trusted members like you. Interested? Tell us why you would like to improve the Jan Akkerman musician page.